Port Isaac (Cornish: Porthysek) is a small and picturesque fishing village on the Atlantic coast of north Cornwall, England, United Kingdom. The nearest towns are Wadebridge and Camelford, both ten miles away. Port Gaverne, commonly mistaken to be part of Port Isaac, is a nearby hamlet that has its own history. 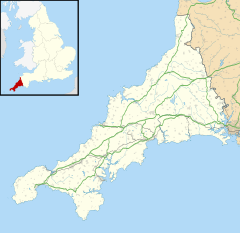 The meaning of the Cornish name is "corn port", indicating a trade in corn from the arable inland district. Since the 1980s, the village has served as backdrop to various television productions, including the ITV series Doc Martin, and is home to the group Fisherman's Friends, sea-shanty singers. Port Isaac's pier was constructed during the reign of Henry VIII. A 1937 history said, "...Tudor pier and breakwater have now yielded to a strong new sea-wall balanced by an arm on the opposite side of the cove, and we do not doubt that the fishermen sleep more soundly in their beds on stormy nights." The village centre dates from the 18th and 19th centuries, from a time when its prosperity was tied to local coastal freight and fishing. The port handled cargoes of coal, wood, stone, ores, limestone, salt, pottery and heavy goods which were conveyed along its narrow streets. Small coastal sailing vessels were built below Roscarrock Hill. The pilchard fishery began here before the 16th century and in 1850 there were 49 registered fishing boats and four fish cellars. Fishermen still[when?] work from the Platt, landing their catches of fish, crab and lobsters. The historic core of the village was designated a Conservation Area in 1971 and North Cornwall District Council reviewed this in 2008 with the endorsement of a detailed Port Isaac Conservation Area Appraisal document and a related Conservation Area Management Plan. The village has around 90 Listed buildings (all Grade II). The Port Isaac lifeboat station was established in 1869 following the delivery of two lifeboats, Richard and Sarah. The former boathouse building was until recently the Post Office but is now a gift shop. In the early 1960s the Royal National Lifeboat Institution introduced the Inshore Lifeboat, and in 1967 the Port Isaac Station reopened with a new class D inshore lifeboat. Since that time, the lifeboat has responded to more than 623 calls, saving more than 333 lives. Today,[when?] Port Isaac's crew and shore helpers man the station 24 hours a day, 365 days a year, providing full coverage of part of the north coast of Cornwall. A later lifeboat is called 'Copeland Bell'. In July 2012, the crew of the lifeboat received medals for gallantry following a dangerous rescue. This was only the second time in RNLI history that the entire crew of a D class, inflatable, lifeboat have received gallantry medals. It was the first time a silver medal had been awarded to a member of a Port Isaac crew since 1870. Until the closure of the Okehampton to Wadebridge railway line in 1966 the village was served by a station at Port Isaac Road. The station, some three miles (five kilometres) inland from Port Isaac, opened on 1 June 1895, and had a passing loop and a single siding with headshunt that served a goods shed and loading dock. All its buildings were built of local stone: station building and signal box locking room on the up platform, the small waiting shelter on the down platform, and the goods shed. Ticket sales were low, 4,500 annually in 1928, dropping to less than 2,000 in 1936; freight dropped in a similar way over the same period. The station layout did not change until the station siding was taken out of use in December 1965. The station was unstaffed from 6 December 1965 and closed on 3 October 1966. The station buildings and goods shed survive largely unchanged. There are two large car parks on the outskirts of the village. The village is served by Western Greyhound's 584 bus service from Wadebridge to Camelford which runs five times daily in each direction, except for Sundays. A summer Sunday service provides up to four return journeys. Newquay Cornwall Airport, located in Newquay, is the closest airport to the village. The church of St Peter was built as a chapel-of-ease in the parish of St Endellion in 1882–84; Port Isaac became a separate parish in 1913, though more recently it has returned to St Endellion parish. The church is built of granite and stone and the style adopted was Early English. The village has had three Nonconformist places of worship: the oldest was a Quaker meeting house, 1806; from 1832 it was used by the Baptists but was converted to a dwelling house in 1871. The United Methodist chapel (1846) and the Wesleyan Methodist chapel are both now closed. The nearest Roman Catholic church is in Tintagel. Poldark (1975–77), a BBC television series, used locations in the area. Tarry-Dan Tarry-Dan Scarey Old Spooky Man (1978), BBC supernatural play. The Nightmare Man (1981), BBC drama serial, filmed in and around the village – which doubled for a Scottish island. Oscar and Lucinda (1997), film. Saving Grace (2000), a comedy film, was filmed in and around the village. DIY SOS (2001), featured the village hall being decorated. Doc Martin (2004–present), ITV series, Eight series and counting filmed in the port (using the fictional name of "Portwenn"; also used in the Sky Pictures movies Doc Martin and Doc Martin and the Legend of the Cloutie under its true name, "Port Isaac"). The Shell Seekers (2005), a television production with Vanessa Redgrave, where the village was used as the backdrop and many scenes were shot in the main street. Fisherman's Friends (film) (2019), a film about the shanty-singing band of the same name, who hail from the village. ^ "Must see fishing villages in Cornwall". Travel Daily News. Archived from the original on 7 September 2012. Retrieved 13 May 2015. ^ Mee, Arthur: Cornwall; The King's England; London: Hodder & Stoughton, 1937, p. 184. ^ Stuff, Good. "Listed Buildings in Cornwall". www.britishlistedbuildings.co.uk. ^ "Port Isaac Lifeboat Station". rnli.org. ^ "Port Isaac article in Genuki". Genuki. Retrieved 7 May 2010. Wikimedia Commons has media related to Port Isaac. Wikivoyage has a travel guide for Port Isaac.